U.S. Air Force captain Steve Tate — call sign “Tater” — scored one of the first aerial victories of Operation Desert Storm, downing an Iraqi air force Mirage F.1 during the night of Jan. 16 and 17, 1991. Few people have heard that story from the Iraqi pilot’s perspective. 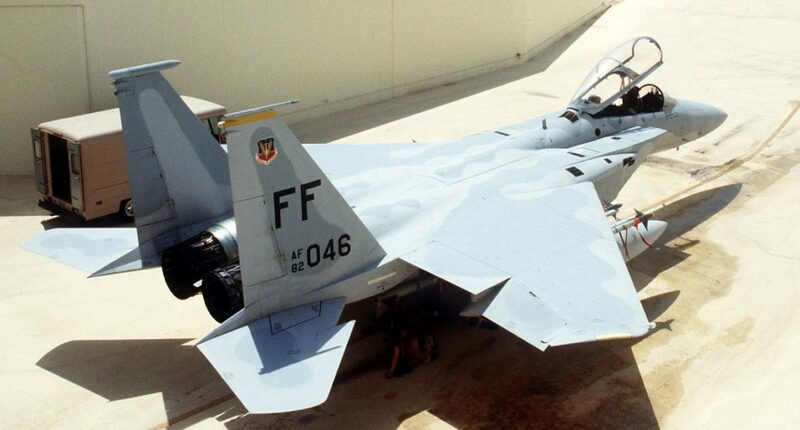 Tate took off with three other F-15C pilots at 1:30 in the morning from King Abdul Aziz air base in Saudi Arabia. After refueling from a tanker, the formation headed north, escorting a strike force including F-4Gs, F-15Es, F-111s and B-52s. Once on station southeast of Baghdad, Tate split his formation into two pairs that flew along counter-rotating racetrack patterns for mutual protection. Around 3:20, the crew of an E-3 radar plane called out a possible bogey heading towards Tate’s numbers three and four – and the strike package. Tate turned around and locked onto the Iraqi fighter — a Mirage F.1 — which was heading west at 8,000 feet. After confirming the Iraqi jet’s identity, Tate fired a single AIM-7 Sparrow from a range of 12 miles. The missile hit the Mirage four miles from Tate’s aircraft, causing a huge fireball. This lit up the nocturnal sky so well that Tate was able to see the Iraqi aircraft breaking up into “millions of pieces” and then burning after crashing to the ground. Now flash back a few hours. On Jan. 16, 1991, the Iraqi air force’s No. 79 Squadron maintained a detachment including several Mirage F.1 interceptors at Abu Ubaida air base near Al Kut, southeast of Baghdad. During the night to Jan. 17, two pilots from that unit were on duty — Lt. Col. Sabbah Mutlag and Captain Dulaimi. Around 2:30 in the morning, local time, the pilots were ordered to their aircraft. Mutlag and Dulaimi made a careful walk-around, paying special attention to the Matra Super 530D medium-range air-to-air missiles, one of which was installed on the underwing pylons of each Mirage — and the Matra R.550 Magic short-range missiles mounted on the Mirages’ wingtips. They climbed their ladders and strapped themselves in, starting a long wait for further instructions. Three quarters of an hour later, the order to scramble came and Mutlag and Dulaimi signaled their plane captains to start the engines. Nothing happened. Despite multiple attempts, two different engines on two different Mirages failed to start. Jumping out of his cockpit, Dulaimi asked his ground crew about the possible reasons for the twin failures and chances of repairing the aircraft. Concluding their aircraft were dead, Dulaimi – as formation leader – requested that Mutlag take a replacement Mirage and scramble alone. The Iraqi colonel ran to the next hardened aircraft shelter and found a Mirage F.1BQ – a two-seat conversion trainer with combat capability – armed with a pair of R.550 Magics. Without a second thought, Mutlag jumped into the cockpit and was rewarded with a successful engine start. Once airborne, Mutlag switched on his master arm switch and called his ground controller with a request for a vector to a target. He was ordered to turn to a heading of 285 degrees. That controller warned that an engagement with more than one enemy aircraft is likely. The very same moment, the radar warning receiver of Mutlag’s Mirage warned him he’d been acquired by an enemy airborne radar, roughly from a nine-o’clock direction. Looking to his left, Mutlag saw a small, red and white puff in the sky. As this wasn’t the first time that he’d had a U.S.-made air-to-air missile fired at him, he recognized the threat and immediately jerked his Mirage into a gut-wrenching break to port. Moments later, two ghostly smoke trails flashed by his canopy. The Iraqi pilot had just survived his first encounter with Tate’s F-15s. Rolling out, Mutlag attempted to acquire his opponent with the radar – but without success. He called his ground control with a request for a new vector. This time, he was ordered to turn to a heading of 310 degrees. Eventually, his radar detected several aircraft around 40 kilometers ahead. This was far too far away for an engagement, but the Iraqi decided to attack. Almost immediately afterwards, his RWR warned him of another lock-on on his aircraft. This time, the threat came from his seven o’clock. Mutlag turned his head around to take a look – but it was too late. A large exposition occurred on the top of his tail and the aircraft immediately began disintegrating. With no reaction from his controls, the Iraqi pilot was left without a choice but to eject. He descended under a parachute to a village only a few kilometers outside Abu Ubaida air base. There he spent the rest of the night, returning to his unit in the morning.